Nothing is better than having feet that feel and look good and making sure that aside from their great appearance, is our comfort in doing everything that requires our lower extremities’ help thus; our dear footsies should always be in great form and shape. Having a foot spa nowadays is no longer a form of luxury. Sure it’s an indulgence but we can all agree that our feet deserve it so much. It only matters where to have your pampering fix that fits just right to your budget. Elite Nails Spa is proud to share that despite a lot of options available for consumers, we remain to be the regular place of spa-savvy people as we continuously strive to provide more than our client money’s worth. As we hit our third year mark in the industry, we remains to be one of the most affordable specialty nail spa in the market. Here's a foot pampering experience fit for a king & queen, for you! 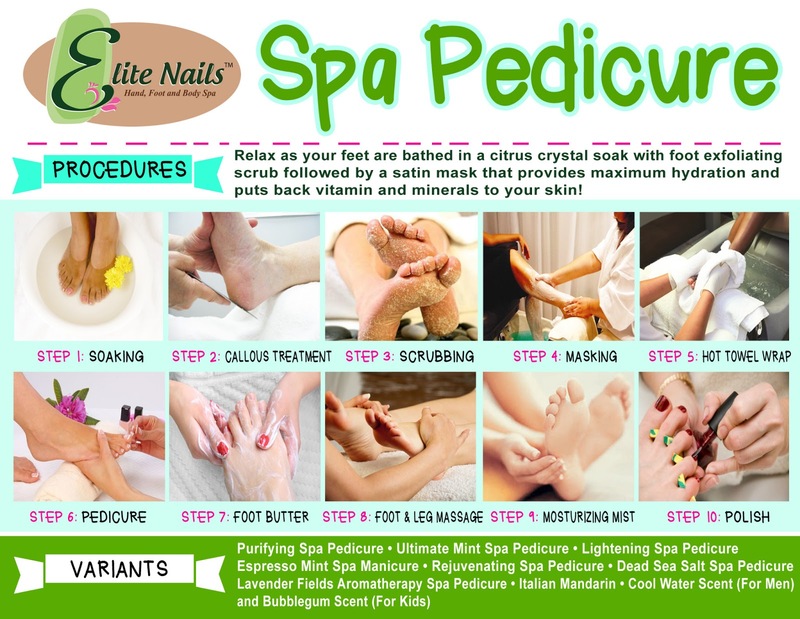 Indeed, you are getting real value for money with Elite Nails’ foot treats that not only gives you the best foot spa experience but also big savings! Under the Elite Spa Pedicure, feet are soaked in a warm and aromatic foot soak that immediately banish the feeling of exhaustion from your feet. The foot soak is also capable of softening stubborn calluses and gives ease to for the ‘scrubbing’ part. Your feet are cleansed before an application of natural scrub that removes all traces of dead, rough skin. Our scrubs are made of organic ingredients and this part is indeed a sure treat as our therapist gives you an invigorating scrub revealing a fresh, rejuvenated skin after rinsing. Next, a mask is applied generously to your both feet and legs. The mask coats your feet & legs in a creamy and cooling blend of organic extracts that works wonderfully to condition and exfoliates more your skin. Let your feet rest for a few minutes while wrapped in a hot towel. Of course, no day of pampering is complete without a pedicure. Why? Because nothing perks up your feet like perfectly polished toes. 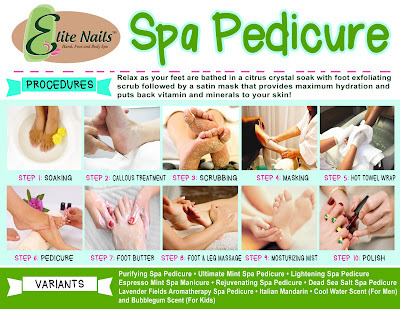 Elite Nails’ standard pedicure begins with warm footbath (foot soak) followed by the removal of dead skin from the feet. The softened cuticles are then pushed back from the toe nail. The toenails are then trimmed and buffed to perfection then moisturizing foot butter is applied to your feet and toes. But wait, there’s more! Prepare for a feeling of wellness as you feel your blood circulation improve with a relaxing massage from legs to the sole of your feet capping it off with a foot mist. Finally, the toenail polish is applied.